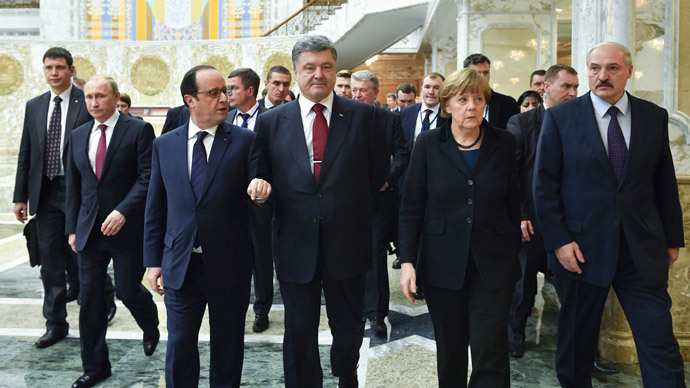 Marathon negotiations in Minsk between the leaders of France, Germany, Russia and Ukraine have managed to produce a ceasefire agreement between Kiev and the rebels in the east of the country, raising hopes for an end to the violence. New EU sanctions against 19 individuals, including five Russian citizens, will be implemented on February 16. German Chancellor Angela Merkel confirmed reports at an informal EU summit in Brussels. “If there are difficulties, I don’t exclude additional sanctions,” Merkel added. EC president Donald Tusk said the EU is ready to put further pressure on Russia if the new Minsk peace agreement is not adhered to. The Normandy Four will review how the Minsk agreement is being implemented in the coming days and may plan another summit, French President Francois Hollande said. “We thought that if the ceasefire is adhered to … then we will need to have at least a telephone conference between the four parties involved in the talks, in order to make sure that everything that was intended is being done,” Hollande said after the EU summit. At least three people were killed and several injured as the eastern city of Lugansk was shelled by multiple rocket launchers on Thursday evening, local media reported, citing the regional Emergencies Ministry. Local officials blamed Ukrainian troops for the shelling. Kim Dotcom has tweeted in the wake of the Minsk deal: "I am proud of Angela Merkel. She shows us that diplomacy and empathy are stronger than the bullying of Americans." The Minsk talks were “tough and very emotional,” Kremlin spokesman Dmitry Peskov said. Peskov confirmed Angela Merkel’s comment that it was Russian President Vladimir Putin who “put pressure” on the rebels in eastern Ukraine to agree to the ceasefire. The Kremlin spokesman also denied President Poroshenko’s claim that an ultimatum was issued to Kiev, Dozhd TV channel reported. The White House said it welcomed the Minsk agreement, calling it a "potentially significant step" in the resolution of the Ukrainian conflict. Washington added, however, that it was concerned about the escalation of fighting Thursday in eastern Ukraine, saying it was “inconsistent with the spirit of the accord."